Robin Goel – Driven by Passion for Digital Marketing. Driven by Passion for Digital Marketing. Top 5 Free Social Media Listening Tools of 2016. Every social media marketing guy’s first and foremost job on his daily checklist is to track his company’s mention on web. To formulate content marketing strategy, tracking mentions and his company’s reputation online forms an essential part of plan. There are dozens of free and paid tools to track what is being said and where about the brand or its product and services on web. Before you reach for your credit card and ponder over purchasing a paid tool try out some of the free social media listening tools. Here’s a small list of 5 that I’ve tried are free. You may also try them out and see what works for you. 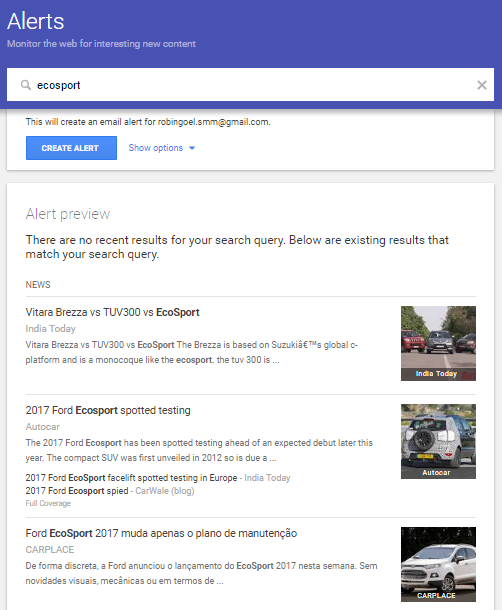 With Google Alerts you can read on web for the interesting new content, mentions of your brand or even yourself, your competitors, industry leaders and so on. Google Alerts is very simple to use and easy to set up, this is probably a good platform to start for beginners. By creating a Google Alert, you will receive email notifications every time Google finds new results on a topic that interests you across blogs, forums, social media and news sites. BoardReader allows users to search multiple message boards simultaneously, allowing users to share information in a truly global sense. 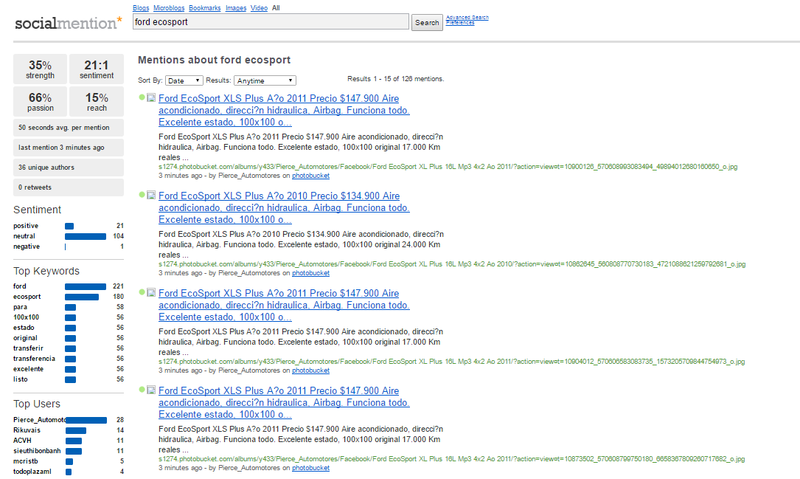 It allows you to run searches on topics/keywords that are being discussed in forums or discussion boards. Users can search out for the answers to their questions from other users who share their experience on that particular topic across different message boards and forums. Social Mention helps you choose the specific platform you may want to search for your search query. 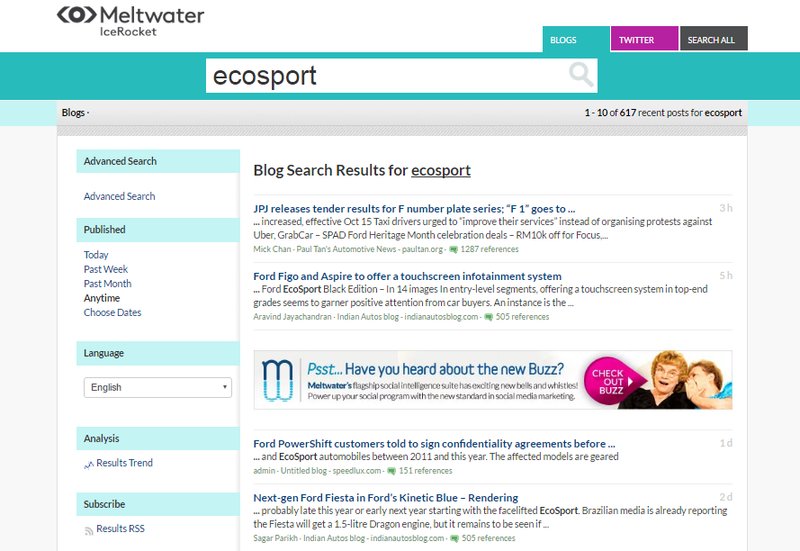 You can choose among blogs, microblogs, images, events, news, videos, audio and more. You can choose a category individually or search across all of them. 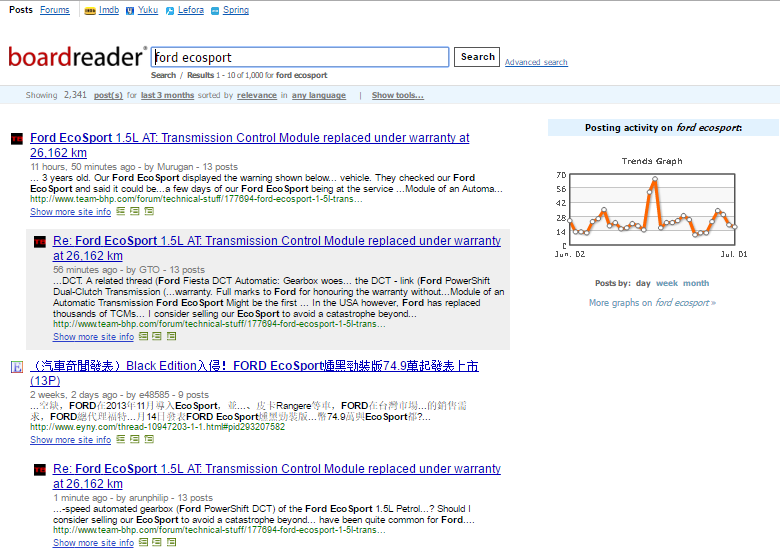 Social Mention also includes various type of statistics about the search in addition to actual search results. These statistics include the sentiment (positive, negative or neutral), top keywords, top users, Postrank rankings, and sources. This recently acquired tool by Meltwater offers blog, Twitter and Facebook monitoring in 20 languages, as well as results graphs that you can experiment with. It allows you to track your search term results from desired time period. It can be used for keeping an eye on your blogger activity, as they claim to have around 200 million blogs in their database and they also provide the possibility of finding the latest trend terms related to your search. Not new, but still a great site for blowing away Twitter skeptics in a single click. TweetReach is the right tool for your business if you’re interested in monitoring how far your tweets reach, as TweetReach measures the actual impact and implications of social media discussions. Just add a short URL from a popular Tweet you’ve recently posted, click the button and it shows you how many people (and who) your Tweet was sent to. Great for identifying who your most valuable and viral Followers are. These are the few tools that I’ve been using for quite a sometime, please feel free to share your feedback on these tools or you’ve come across that would be worth be worth trying. In the 2014 Social Media Marketing Industry Report, created by Social Media Examiner it was found that 92% of marketers felt that social media was paramount for their business. This has been an expanding pattern as more organizations distinguish online networking stages, for example, Facebook, Twitter, LinkedIn, Instagram and Pinterest as extensive systems of potential clients and have hence setup an expert vicinity on these locales. Global ad spend is on track to grow by 5.5% this year and reach $537 billion, with online ad spend accounting for proximately one-quarter of the staggering amount. The global growth of the advertising sector is paralleled closely in the MENA region: digital ad spend in 2013 reached $300 million and is incrementing at 37% per year to reach an astounding $1B in 2017. “Digital advertising is the most expeditious growing segment in the region – and not surprisingly,” says Tom Roy Choudhury, Chief Innovations Officer of Middle East Communications Network (MCN). Online advertising in the Middle East has been the fastest growing segment in the advertising industry, representing highest potential in the region with a huge young, socially engaged and informed population driving the spending on web and mobile platforms. 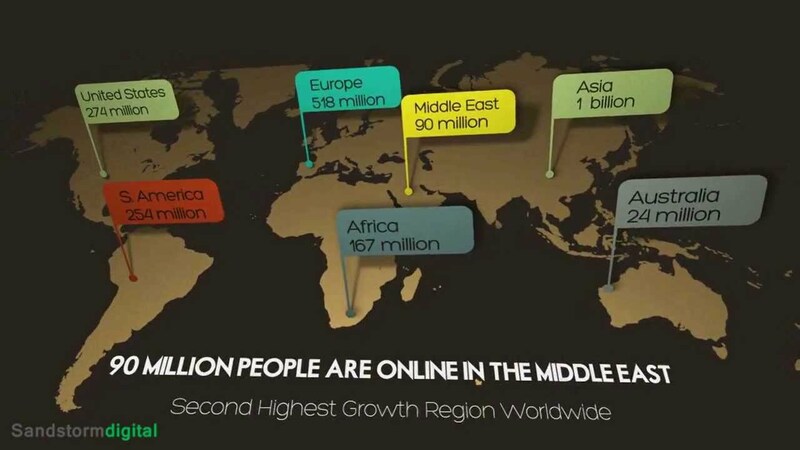 Middle East comprises of more than 50% of the population below the age of 25, representing an intrinsically vigor for the online media industry as young population would be the early adopters of technology driving the magnification of online advertising industry. Verticals such as e-commerce, m-commerce and online gaming have witnessed increased activity in the region with a strong uptake of tablets and smartphones. The value of mCommerce in MENA is expected to reach $4.9 billion by the end of 2015. Global interest in mobile advertising is also surging: mobile ad spend grew 110% in 2015 and is expected to reach $31.5B globally. Whereas Mobile ad spending in the Middle East will increase by 543% per year through 2017. Smartphone perforation and hours spent online in the Arab world, and the GCC in particular, are amongst the highest ecumenical. Traditional media in these countries is still heavily controlled and monitored by the regime. So, we do expect this region to be expeditious in switching to digital. The consumers have already made the shift, advertisers will follow shortly. Given this promise and high level of interest, it then becomes an eventuality to study social media strategies to understand how companies are allocating their digital media budgets, social platforms they are present on, content strategies for superior engagement on social media through our next post. Historically, the automobile industry has always been known for maintaining a customer-centered relationship, but present day customers are far more demanding from those of even a decade ago. Customer expectations and their relationship with their automobile brands have been changing rapidly over the past decade, since the onset of social media and reecent technological developments. Customer presence on social media channels like Facebook and Twitter, and the opportunity to tap them for potential revenue generation is fast becoming a priority among leading automobile giants. This post is aimed at understanding how automobile manufacturers are using social media platforms to boost customer engagement and tapping new opportunities for growth in short. We’ve all read the success stories of automobile brands like Ford with the launch of their Fiesta campaign and the YouTube sensation of VW. 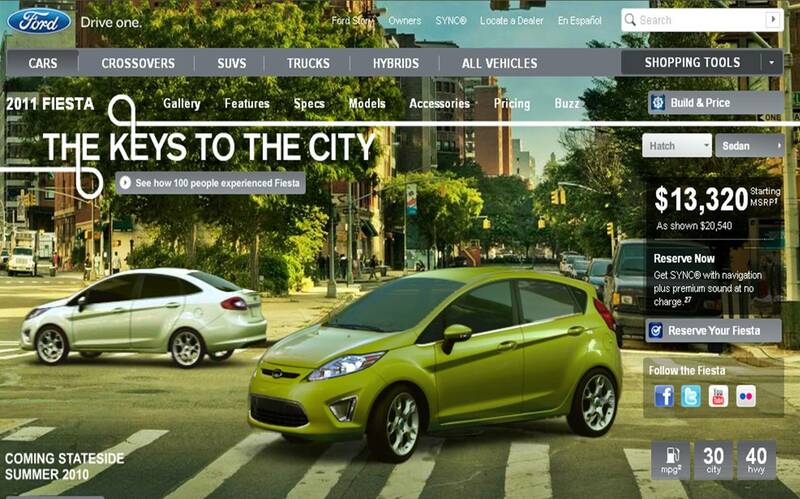 The Fiesta Movement campaign from Ford, launched in April 2009, has set the bar when it comes to determining the effectiveness of social media campaigns in automotive industry. Brands like VW, Ford, Honda and BMW have consistently excelled at telling their story on social media using photos, videos, contests and interactive applications as new ways of communication with their fans and customers. Facebook being widely recogonized as the most powerful social channel, Peugeot recently used Vine to run the first teaser campaign for the launch of its new RCZ R model, while Renault used Twitter to unveil its Twingo car using an “online striptease” making us think that other channels can also be more efficient, depending on the need and strategy. The heart of the automotive industry has technology inherent in it and this is now extended to various social media channels like Facebook, YouTube and Twitter. Mercedes-Benz being the most popular and successful car brand on the social web reached more than 16 million fans in the beginning of April this year. The BMW Facebook page has released several mobile apps, for example “The Ultimate Drive App” that provided the users with road maps where they can mark their favorite drives, leave tips and rate roads and the recent one being configuring your own different series of BMW Cars on their Facebook page. Satisfying the requirements of online users with such brilliant integration leaves a lot of scope for other automotive players to explore. 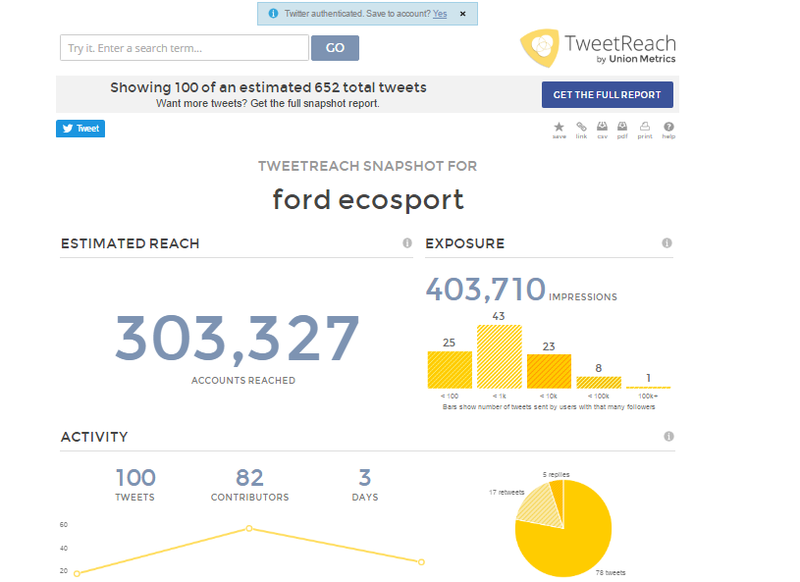 Automobile companies like BMW and Ferrari has been a trendsetter for social engagement. Even in comparison with global non-automobile brands, Mercedes-Benz is in 2nd position with regard to engaging with its Facebook fans. Only the fans of Walt Disney have more Likes, Shares and Comments according to data released by social bakers, and the reason for the same is however understood according to data released by social bakers. Not all social media campaigns have seen the checkered flag of success. Sometimes providing space to discuss and shrare their review in a public forum can backfire, especially when emotions come into the picture. One finest example of this is with the Accord Crosstour facebook page launched by Honda where they had to apologise publicily for their negative promotion. We all know that the automotive industry runs on loyalty. Online reputation management is potentially regarded as the most decisive facet of social marketing, with user-generated content and reviews having a vast influence on purchasing decisions. A single negative feedback from an irrant customer has potential to create communication crisis. A recent study conducted by Facebook reveled that car owners are strongest brand advocates of their car brand than those who aren’t, and tend to share their recommendations with alteast three times more people than the average Facebook user. Social media is a strong platform to communicate with customers and help make a product better. New generation consumers don’t want to be sold to. They want to be informed, engaged, and entertained. The automobile industry has adopted this modern marketing philosophy, putting the pedal to the metal . Check out this interesting video idea from Volvo, where Vam Damn is performing “The Epic Split Feat” making it a hugely watched video on YouTube. The real estate industry has been the number one spender in the online advertising marketplace, surpassing the automotive industry for the past few years in a row. The industry’s shift from traditional (offline) marketing to digital marketing is believed to reach new levels of disparity. Offline marketing mediums such as newspaper ads now only account for 16% of the overall market spend while online ads account for more than 55%. This trend is expected to continue with a steep increase as newer digital platforms such as social media, mobile, video, paid lead generation portals and high-speed internet connectivity all continue to develop, rapidly. So, what does it mean to both property buyers, mortgage houses and realtors? If you’re a realtor, then you know that the real estate market is one of the most competitive industries out there in developing and already developed markets. Indians seem to have become increasingly comfortable making high-value buying such as apartments and plots of land online – if the stats of the recently concluded Great Online Shopping Festival are anything to go by. 36 real estate companies including Tata Value Homes, Brigade Group, Purvankara Developers, Artha Property and Provident Housing were part of the event. This is as compared to just two developers being part of the previous edition in 2013 and none in the festival’s maiden edition in 2012. Real estate developer Puravankara sold over 125 homes within the first 12 hours of the shopping event and had 507 online bookings over the 3- day period. Tata Value Homes secured over 10,000 registrations for their homes across five projects in Bangalore, Chennai, Pune, Ahmedabad and Boisar near Mumbai. 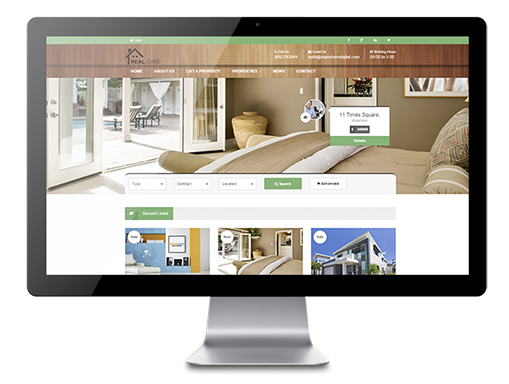 Increased investments and opening up of new real estate portals like housing.com, commonfloors etc are the examples of changing trends. These portals are mainly driven by revenues through commissions and advertisements from brokers or developers and funding from private equity funds. With speculations around better infrastructure to facilitate online property business, experts expect it to grow at more than 30% in the coming years. These data show that digital marketing for real estate will be a very important growth driver. Compared to 7 in 10 Indian buyers who rely on online research for making a purchase decision, the European and US Real Estate markets are more digitally advanced. US markets have seen 9 in 10 home buyers relying on the web as one of their primary research sources. According to a study conducted by The National Association of REALTORS and Google, not only 60% home buyers turned to the web as their first step but the number of real estate-related searches on Google.com has also been growing at 22% y-o-y. However, recent reports also indicate that emerging economies will play a decisive role in defining the future boom in Real Estate industry. For realtors, digital marketing has been the most preferred way to better target your audience and grow your business. With an effective digital communication strategy, you’ll put yourself head and shoulders above your competition and taste success like never before. One thing that has still not changed is the fact that home buying is a family decision and not an individual’s impulse decision. Most home buyers carry out a lot of research and consult family and friends before taking the big decision of buying a house. This means, it’s a very social process and engaging with customers moving out of comfort zone could facilitate him/her closing the deal. Twitter began the rollout last Tuesday of a new look profile pages features— and it appears quite similar to Facebook’s lite version users. The advanced look, which Twitter was tested in February, adds a ton more user information and several new features, one being highlighted each user’s best tweet. Nonetheless, it just applies to the desktop adaptation of Twitter, not the mobile version used by Smartphones and Tablets being the foremost way that individuals utilize the service. The new profile features a larger user photo and customizable header image. Above all, the header picture is more even and shallow. Twitter proposes a size of 1,500 pixels by 500 pixels up from 1252 x 626 in past configuration, yet the picture will be automatically resized to fit. Twitter highlights your tweets that have the most engagement by showing them somewhat bigger than the rest. Case in point, when a tweet gets huge amounts of retweets and answers, the font of the tweet will expand fundamentally. The new setup lets you pin a tweet at the top of tweet section. It’s sort of like favoriting your own tweet and putting it on display.The thought behind the pinned tweet is to allow increased interactivity between an account holder and his or her followers. 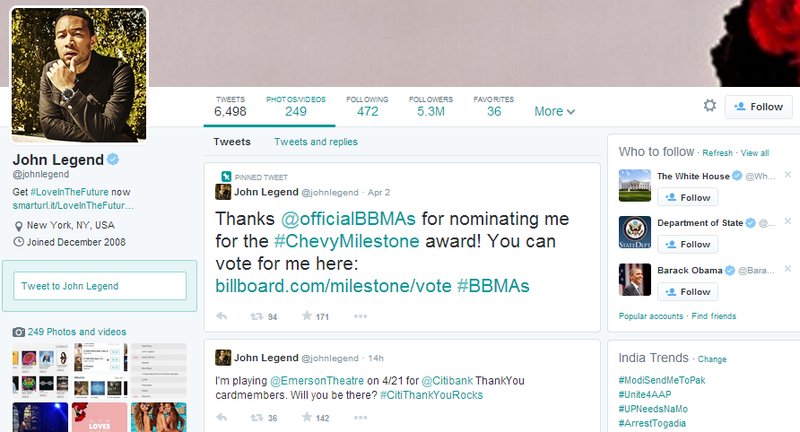 Here’s how a pinned tweets look, John Legend thanking Billboard Music Awards on his nomination. Furthermore, you can now choose which timeline to view when checking out a profile page. You can view original tweets, tweets plus replies to others, and tweets with photos or videos. Twitter bio max out at 160 characters versus the traditional 140 while you still need to communicate in 140 characters or less through your tweets. The new profile configuration is as of now live for a handful of Vip’s and celebrities, including The First Lady- Michelle Obama, Channing Tatum, Weezer, John Legend, and it will likewise appear for new tweeples. The rest of you will be offered a chance to switch over to the new design in the coming weeks. Think back when the number of fans your Facebook page had been the most important facial expression of social media? I’ve observed that most of online businesses focus too much on the number of Facebook fans their competitor has rather than how engaging their community is. Whether you have 1,000 or 1,00,000 Facebook Fans, only a fraction of your posts reaches your audience. The question of how to increase an organization’s Facebook Fan Page engagement has always been a hot topic discussed over the past few years. Together, we’ll learn how to prepare a strategy to build a business Facebook page an interactive medium to engage with its fans. Getting Personal: The first way to increase engagement is to make sure you truly understand your Fans and know what they are interested in. If and when it’s possible, find time to interact with your fans so they feel included. Your community wants to get to know you and wants to be able to relate to you and your company. Role of Visuals: When you mix a great status update with a fantastic image, you will boost your posts’ likes– rather than placing a simple fact as simply text, turn it into a little image, or post inspirational or interesting pics/videos that can pull attention and pursuit. Keep it Short and Simple: Stick to the point and the old saying that less is more. The shorter the status update, the likelier it is to be interacted with. If you use 110 characters or less, there is a 65% higher engagement than longer posts. Fans do not like to do the math to understand a post. Include Call to Action: The easiest way to get your audience to do what you want them to do? – Asking for likes has a hefty impact on increasing likes, as is asking for comments, though the latter does occur at the cost of likes. Call for Questions: Asking simple questions is another neat way to learn about your Fans, while driving interaction at the same time. Ask questions, but for crying out loud, not more than a few per day. Be genuine and creative. Let your random questions be enjoyable. Not something you draw out of a hat to increase your involvement. Utilizing Facebook features: Using Facebook’s features such as Facebook apps, Facebook offers, pinning posts and highlighting the posts keeps your page fresh, active and engaging. Have Fun with Content: People use Facebook to get social and learn, and if you’re able to entertain and inform in your posts, you will get more shares, comments and likes. Using humor on Facebook is an outstanding means to stimulate interaction. Gamifying Community: Facebook games engage people’s competitive nature and can grow your brand’s reach. People enjoy to find out their names highlighted in the community, so commit them that chance with a Facebook photo contest, Leaderboards games. I have been using these tips for developing efficient, interactive and entertaining Facebook page for brands I’ve enjoyed working out with. Once the interactions begin, make sure to following up with your fans and respond to them to improve the quality of your relationships! Now it’s your turn: Feel free to share tips and suggestions that help boost engagement for your Company Facebook Page! When Technology Took Over Politics in India. From how you do your grocery shopping to how you invest your recreation time, it’s a dependable fact that current technology and social media are having intense effects on your lifestyle. So how have these two forces worked their style into the Indian political scenario? Government and political movements are usually low-tech activities, which it all the more surprising looks, that modern tech innovation and social media are impacting our consumption of political campaigns in such paramount and far-reaching ways. The 2008 U.S. presidential crusade drew the attention of the world. In the consequence, the Obama fight’s utilization of Facebook, YouTube and Twitter were generally credited with helping secure the noteworthy triumph of President Barack Obama. One of the most significant changes that internet technology has brought to the creation of political campaigns is the nature of the kinship between the media, the electors, and the politician themselves. For better or worse, real-time discourse is a nearly daily occurrence for volunteers and politicians; voters can now immerse themselves more than ever in political movements. Major political parties like AAP, BJP and the political efforts like “Donate Your Tweet” and “Chai Pe Charcha” have thoroughly benefited from the increasing prevalence of social media platforms, letting people who can’t be there, due to geographic or monetary reasons, to unite with the movement. Delhi 2013 Elections proved to be the most social election ever in India, paving way for a new political party AAP, making profound changes in the Indian political environment. Political parties realized that campaigns can’t merely rely on running ads on live TV if they require reaching younger voters under the age of 30. The challenge for campaigns was to take on this group in mediums outside of live television and for campaigns to diversify their communications channels. The 2014 election year reflects the major political campaigns make innovative use of Social Media technology for get-out-and-vote initiatives. It also used twitter trends and social media advertising to push voters to polling booths. Social Media is playing an important part in generating political interests in Indian youth that has never been seen before. A social media campaign run by the Electoral Commission drew record levels of voter registration and turnout in elections held in four Indian states, including the capital, New Delhi, in November and December last year. There are more than 200 million Internet users in India. Big chunk of this comprises of young and mobile urban residents. This demographic is also socially engaged, making for the highest Twitter and Facebook usage in the world, outside of the United States, according to Alexa. Of 790 million eligible voters in India, some 160 million are first-time voters between the ages of 18 and 24 years old. These numbers might justify the social push by political parties as a persuasion tool. Lately, a bit of high-profile political parties have partnered with PR firms and Digital Media agencies to bolster the availability of their political agendas and presence on real-time basis. Twitter has been exploited immensely, resulting in trending wars and trends hijacking with more 1000 tweets in just few minutes. Social Media has been subjected to significant abuse, with some political leaders have been accused of boosting their apparent popularity of social media with legions of followers who don’t even exist and of using social media to slander their opponents. The bottom course is this: technology and politics, once an unlikely coupling, are making for huge changes to Indian voters. Have you witnessed any changes to the political scenario as an Indian voter? With the increasing importance of content to commercial success online, content is not something to pull up stakes to an intern; it takes a strategy to ensure it really supports marketing. Like all marketing activities, the objective of content marketing is to convert prospects into customers and establish more loyal and relevant relationships with existing audience. While the ultimate goal is to drive increased revenue for companies, content marketing is more focussed on presenting information and advice that enrich people’s lives. Here’s a six step approach to a business content marketing strategy that I have been following since past few years. Theme selection: define what you want to be celebrated for. There is a content overload in the world. Your content must be valuable by educating or informing the audience on a deeper level. The magic occurs when you encounter a subject you are knowledgeable in and that the market is still waiting for. Choose your content domains smartly and be consistent in your selection. Content conversion strategy: content marketing has to contribute to an increase in revenues. Think upfront about where conversion should take place. Define a top conversion point and lead people to this point through your content. Make sure you are not using your content marketing strategy as a hybrid sales strategy; readers will look properly through this and click away from your website in search for conversions. Content planning: once you have defined the themes and the conversion strategy, create an editorial calendar. Put up a roadmap so you recognize when and where content will be dealt. If you’re too busy to run the program yourself, assign a member of your team to prepare it for you. Streamline the content calendar with all other marketing actions in order to increase impact. Create shareable content: once the content is established, people will respond to it. Be candid to this engagement from your audience and be ready to answer questions or to give feedback. Good content does not constantly has to be entertaining, but humans learn in an inborn appreciation for the content that induces them to cringe, laugh, or cry. Users also tend to discuss and share content a lot more when it impresses them on an emotional level. Facilitate content conversation: The content needs to be easy to share and worth sharing. You require to remain in front of your audience as much as possible, without being an irritation.Masses tend to broadcast content that is positive, relevant, appealing and contains a benefit. Don’t be afraid to filter out what isn’t working and write more about the subjects that are gaining traction. Take that into account during the creation of the content. Measure success: the moment the content strategy is up and running you can measure its impact through a set of relevant KPIs. As you work to push out timely content, look at performance and engagement based on analytical data, not common sense assumptions. The recipe for success is simple: provide people the information they desire, when they want it, and where they want it. Yet, in reality, following this formula can be difficult and complex. Even so, I am following these 6 steps in approach to content marketing, helping me creating successful content strategies for brands I work with. Content marketing has already been acknowledged as one of the key challenges companies facing these days in their communication strategy. Most companies realize the need to change their communication model due to the increased influence of social media and their competitor’s web presence. Top marketing managers of these companies are busy finding ways to become more responsive towards questions and feedback’s from consumers on social networking sites like Facebook and Twitter. Companies as well realize that they should not just be proactive in distributing with their customers, but regularly feed customers with conversation-worthy content. The latter is the main problem while approaching customers. Most companies don’t know what content marketing means and how it can be leveraged to achieve business objectives. In this part, I would like to share my experience on why content marketing could be enforced in whatever sort of business. Here are the objectives to achieve with content marketing. Being recognized as subject matter expert: Being aware of the latest trends, tools and technologies lead to innovation and keeps you ahead of your competition. Your clients are invariably looking for more in terms of comfort, satisfaction and quality to enhance their lifestyle and ease. Being relevant and coherent with your content marketing model will enhance the brand positioning and will assist you to be recognized as an expert in your area of occupation and therefore will increase worldwide awareness of your brand. Building healthy relations with your customers: Sharing new and fresh content at regular intervals is a must to build effective content marketing model. This will not simply encourage your customers to stay in contact with your brand but will also open a door for positive feedback and recommendations. Supplying them with information that is relevant, interesting and useful is often conceived as result driven strategy in the long-term as compared to bothering them with new offers and coupons every other day. Offering relevant and valuable content in terms of marketing collaterals will make it more acceptable to establish a promotion every once in a while. Grow business by drawing in new customers: Like they say bad feedback reaches thousand and nice feedback reaches fewer. Your content is usually shared with existing customers and fans. If the content is strong enough, it will reach new sets of customers in the form of your customer’s family, friends and colleagues. This is how community is built and content plays a central part in getting contacts with young people. Solid and creative content arouses the curiosity of young panoramas, which progresses to them want to learn more about your brand and your offerings. In the end, content marketing should lead to an increase in business. Converting customers into brand influencers: Just a quality and price competitive product is not enough to satisfy a client these days, your competitor might also be doing the same and it won’t guarantee his loyalty towards your mark. Your marketing objectives should be such that it can fulfil the customer’s emotional needs as comfortably. Informed customers convert into brand influencers. Increasing online reach: Finally, strong and relevant content will automatically ensure that your company receives a more extensive reach on the internet and makes a substantial brand. This will increase visibility for your content and increase its impact. A wider online reach makes it easier to accomplish the first three objectives mentioned above. Hope this piece of content help you in building successful content marketing model as the same has been helpful to me in leading successful marketing efforts for the brand with whom I have worked with. You may also share your experience while dealing with your customers or anything that I may add to this post.